Entry areas feel overwhelming because of all the "stuff" that needs to be kept in them. Baskets are great for containing items while hiding the mess. This is a great example of using baskets for kids' sports gear and equipment for various activities. It's all labeled and contained and easy to find (and easy to put back). 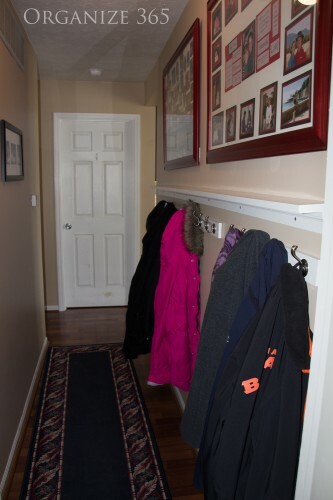 One way to keep an entryway organized and clutter-free is to have hooks for coats, sweaters, backpacks, dog leashes, etc. 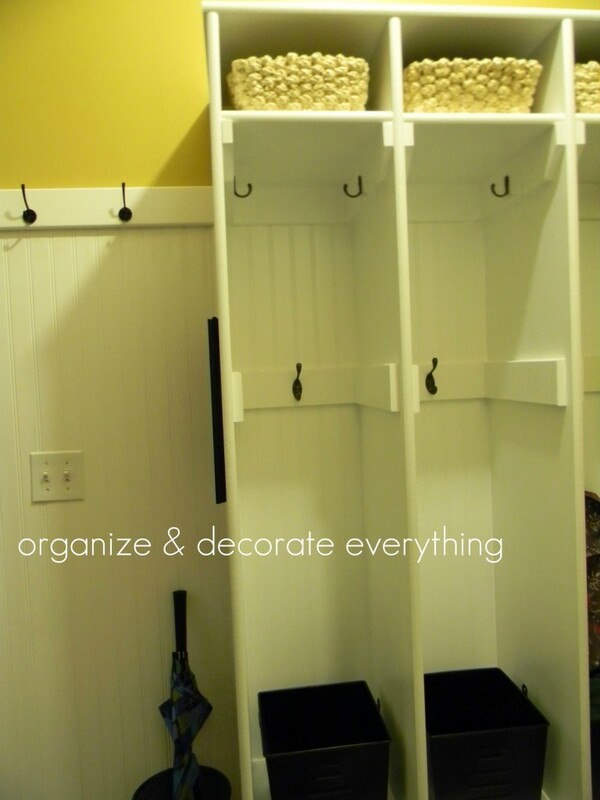 It keeps things off the floor and helps keep the entry from becoming cluttered. 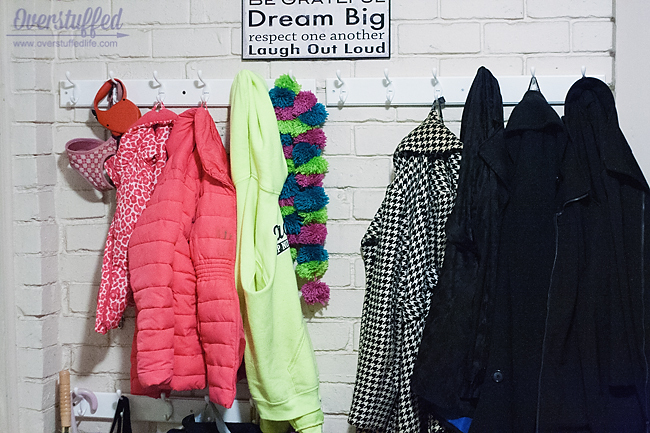 You can vary the heights of the hooks so kids can reach their own and be responsible for hanging their own things. My friend Lara shared some great tips for decluttering and organizing her entry area, including labeling each person's hooks. See the lower row of hooks too? Click the link below the picture to check out more pictures and all her tips. Here's another example from Lisa with steps for adding hooks to her hallway and a small ledge above them for keys, phones, etc. In addition to hooks for each family member's coats, she also uses hooks for a library bag, dry cleaning bag, and her purse. Don't have space to do a wall with hooks? Then make the most of the space in your closet! There are lots of great tips for organizing a coat closet or front closet in this video from Alejandra (click the link to go to the video). 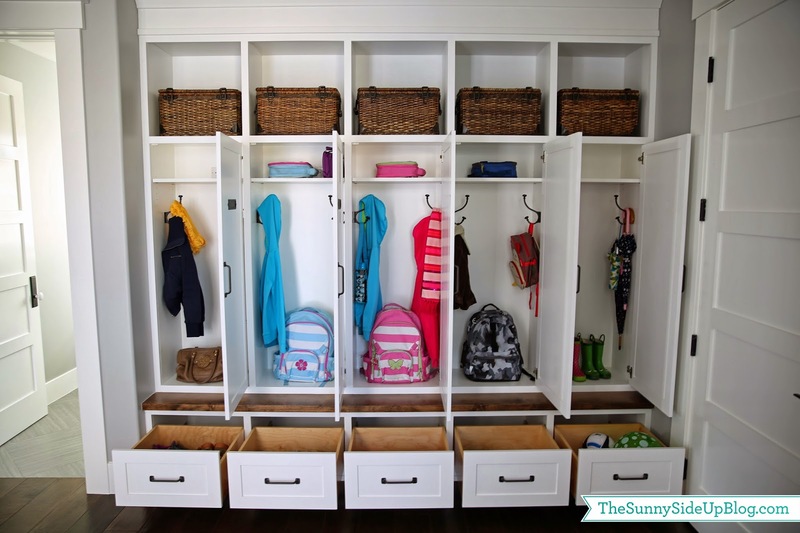 You can even convert your closet to a mudroom by adding hooks, shelves, drawers, and/or baskets, like this example (click the link below the picture for the how-to details). If you're handy, and have the space for it, individual lockers (with or without doors) help keep each family members' items contained. That makes it a lot easier to find what everyone needs in the morning when you're heading out the door. 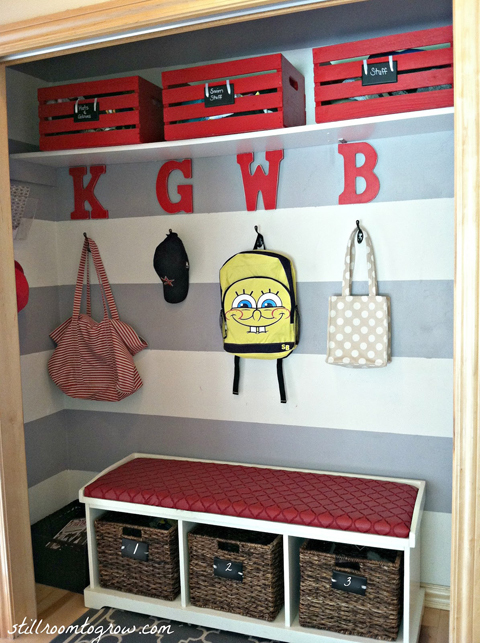 Here's another beautiful mudroom! This is when it's open, so you can see everything that it holds, but those drawers and doors close up and then it's even more beautiful! Don't have time to spend creating a beautiful mudroom or entry way? 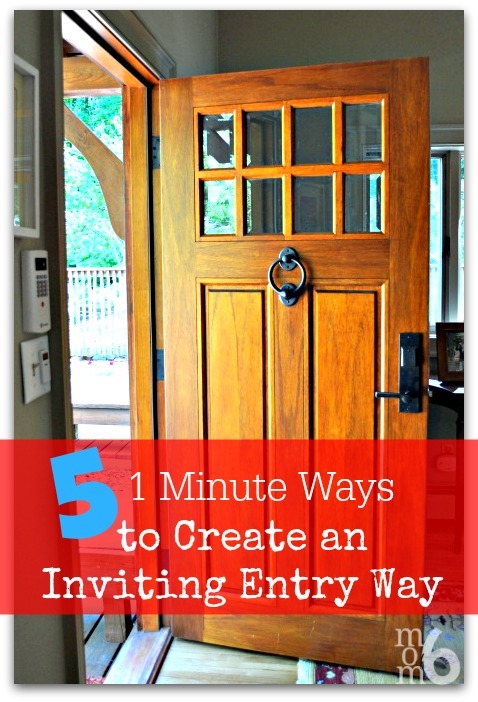 Check out these 5 1-minute tips to make your entry inviting! So who's ready to organize their entry this weekend? 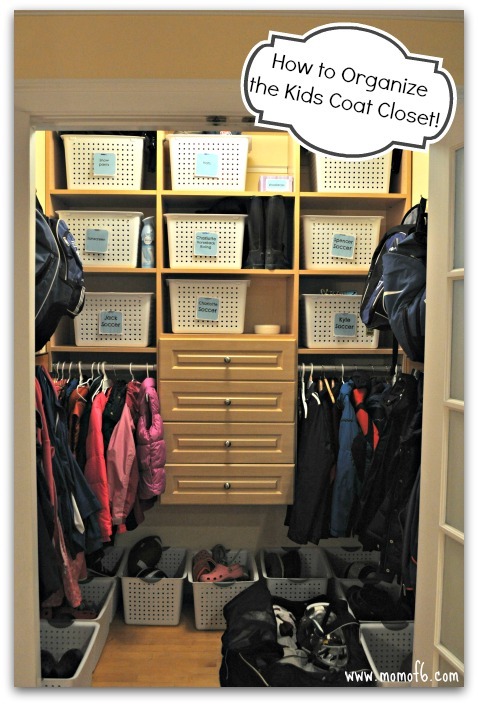 You can find lots of other organizing ideas for entry areas on my Entryways, Dropzones, and Command Centres board on Pinterest. 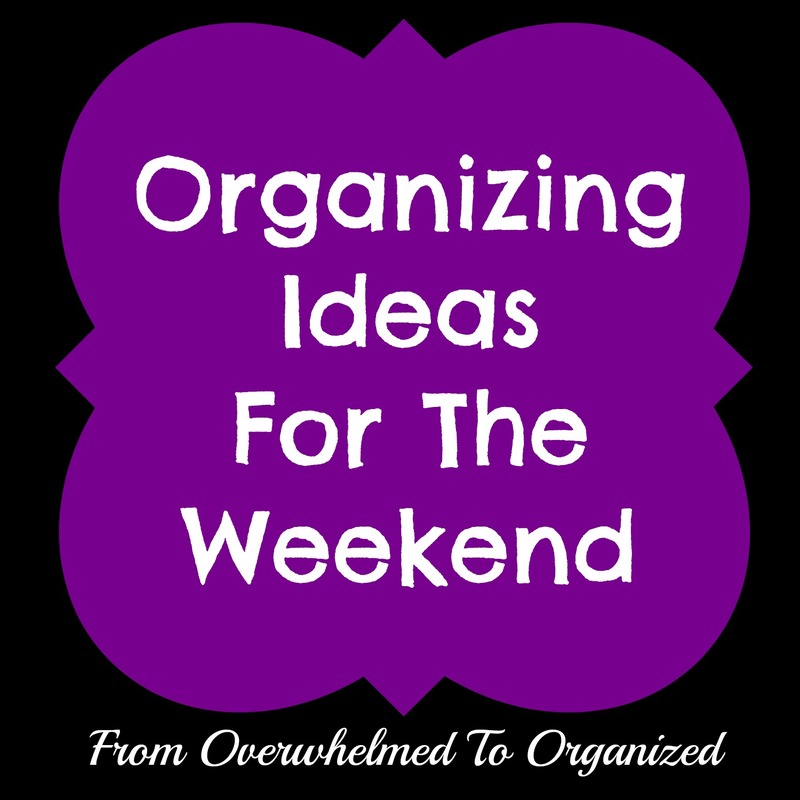 If you've already organized your entry, or if you'd just like additional ideas of what you can organize this weekend, there's a tab at the top of this page called Organizing. 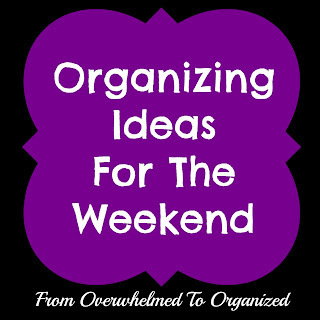 In the drop-down menu there's a page with links to all my Organizing Ideas for the Weekend posts. Are you overwhelmed with too much clutter in your entry? 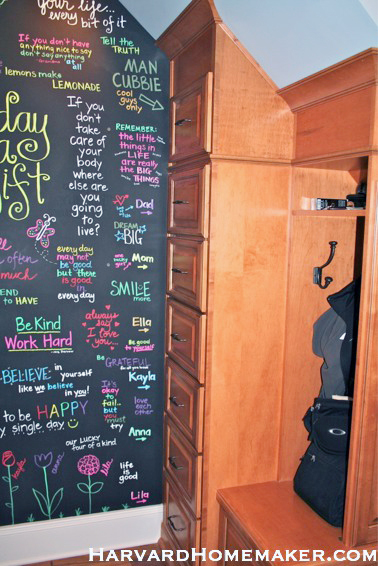 Which of these tips do you think will help you be most organized? What tips can you share with us for keeping the entry area organized? I've recently been looking for ways to organize our entry now that we're starting to take our shoes off in the foyer upon entering. Thanks for the great ideas! I need to look into hooks as well. I love all these ideas! I have been looking for a way to spiffy up our entry way. It is not that it is small, but it is angled with very few little wall space. Thanks for the great mudrooms too. I love the locker look! It would take one tallllllll man to reach that top Man Cubbie drawer! Even then, how can you see inside it? great tips! I love that huge cabinet!